NEW ORLEANS, La. – The Sun Belt Conference office announced the 2014 Preseason Coaches Poll, July 19. NM State was selected No. 11 in the poll with 26 points. NM State went 2-10 in 2013 during Martin’s first season as head coach after playing one of the toughest schedules in the school’s history. The Aggies faced five teams that had participated in a bowl game the previous season while also playing two teams ranked in the top 15 in the nation. UL Lafayette was selected as the preseason favorite in the conference, garnering all 11 first-place votes in the poll. Arkansas State received 102 points, followed by South Alabama (98), Troy (84), UL Monroe (78), Texas State (70), Appalachian State (47), Georgia Southern (44), Idaho (29), Georgia State (27) and NM State. The annual Sun Belt Football Media Days will be held in New Orleans, La., inside the Superdome, July 22. Coach Martin, along with center Valerian Ume-Ezeoke and safety Travaughn Colwell will be in attendance. 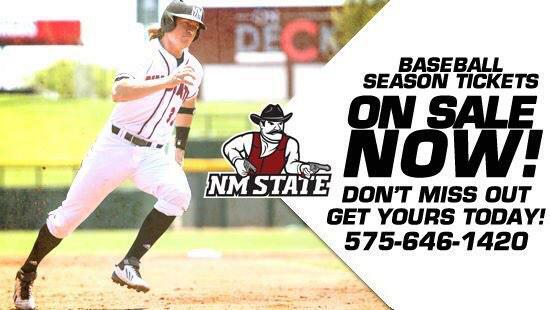 NM State opens the season with Cal Poly on Thursday, Aug. 28, at 6 p.m.